Aritic PinPoint has complete feature of social media marketing campaigns. Using this feature you can post status updates directly on your company social media page/ profile from Aritic PinPoint dashboard. Publish a post on social media networks at a time or schedule a post to be published in the future. 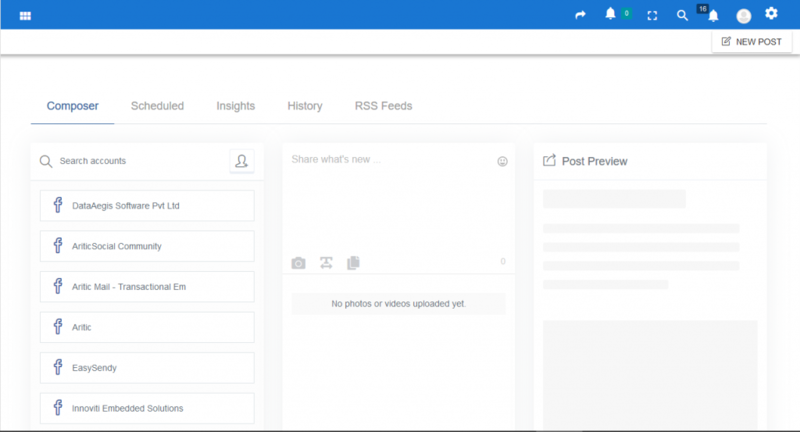 Upload all social media updates from CSV file and schedule in one shot. Manage social media updates from single calendar view. View the live preview of the post (text, image, link or others) for each social network. View the stats of a published post(stats about posts made per day, posts made on each available social network, information about the posts, if it was successful or unsuccessful for each social network). View the history of the published posts. For every published post you can see the message/text, the link or image from the post. Connect all RSS Feeds and select social networks where will be published the RSS Feeds. The tool Social Automation Bots allows to follow the posts and see when a published post has new likes and comments. Schedule social media posts automatically posts per days, months or years. The Groups Accounts tool allows to create groups with social accounts and publish posts in all accounts with a click. 1.Once you are inside your Aritic PinPoint account, navigate to Campaigns > Social Campaigns from left menu. 2. From this dashboard you can connect your social media account and start scheduling updates to your social media networks. 3. From this dashboard, you can also add RSS Feeds. Accounts List/Groups List – display all accounts or groups and user can search/select accounts/groups. In the same are user will see the accounts manager button. By clicking on the button user will be able to manage accounts and groups. Posts Composer – contains the post composer and multimedia gallery. In section are displayed the buttons to display title, upload new files and the popup with last posts scheduled/published/drafted. Preview – contains the post live preview where are displayed the post content and selected accounts or groups. From there user can unselect selected accounts. Further, you can navigate to Calendar > Social Calendar to plan and schedule social media posts.